I guess everybody gets lucky once in a while if they open themselves to the possibility. I think antique dealers wake up every morning believing that this will be their lucky day. And most nights they go to sleep thinking “maybe tomorrow’. But occasionally we do find ourselves in the right place at the right time and we get lucky. It happened to me one morning in mid-90’s. When we would go into London to visit my sister, we liked to stop en route at a little antique mall situated in a strip mall right off the 401 and Wellington St. Although not large, it had a few good dealers and quickly changing stock so it was worth a look. One sunny, summer morning we were arriving in good time so decided to pop in and do a quick tour. Jeanine went one way and I went another. We tend to spread out and then call the other one over when we see something of interest. We are usually quite casual about it, and relaxed. And so it was on this morning with lots of things to look at but nothing of interest jumping forward. I looked in all the booths where I would regularly find something, and it was all “sorry, not this time.” I wandered around for another ten minutes or so and decided it was time to find Jeanine and barring her having found something of interest suggesting we split. Then I looked down at the floor in a booth otherwise filled with china figurines and tea cups and there on a little box sat a really interesting old snare drum. I don’t have a lot of knowledge of musical instruments, but I know that a good one can be worth a lot of money, and also that this is particularly the case in some handmade instruments such as violins, and in classic guitars and drums associated with rock and roll. Also, as you continue in the trade if you are paying attention you continue to develop an instinct for age are rarity. When I laid eyes on this drum, it immediately hit all my buttons. Obviously early and in untouched but good condition, it was made of pattern engraved chrome. There on the side above the air hole was an early Ludwig drum logo. The heads were ripped and the springs were hanging loose but I could see that everything that mattered was there. I anxiously turned over the price tag already calculating how many hundreds I would be willing to risk on this venture. $28. I was elated. And below it written old chrome snare drum, and the venders number, so I knew it was legit. I clung that thing to me like a beloved baby and scurried over to Jeanine. “Have you found anything?” I asked. “Nope. What’s that you’re holding?” I could barely contain myself. It’s a really cool, old snare drum, and it’s only $28.” “But is it worth anything? Look the top is all ripped and torn, and besides are we buying drums now?” Well there are times when you can be patient and have a meaningful discussion, and then there are times when you just want to buy something and get the hell out of there before someone clues in, so I was a tad abrupt. “Yes, today we are. I know what I’m doing and we are buying this drum. Trust me”. Jeanine could sense my excitement, and so even though she did not share in it, she tossed me one of her famous Gallic shrugs and said “whatever”. The guy at the checkout was suspicious. “Where did you get this? I didn’t see this come in.” In that booth over there I gestured, and it is clearly priced at $28 with a description, and booth number, so I would like to buy it now please.” He rung it up registering his reluctance, and as soon as he handed me the receipt, jeanine and I were out of there as fast as we could go. Reminds me of that great Ikea commercial that comes on around Christmas where the woman shouts “Start the car.” No ne followed us. So the drum came home. Without doing any research I knew that we would at least get a few hundred dollars for the drum based on aesthetic value alone. 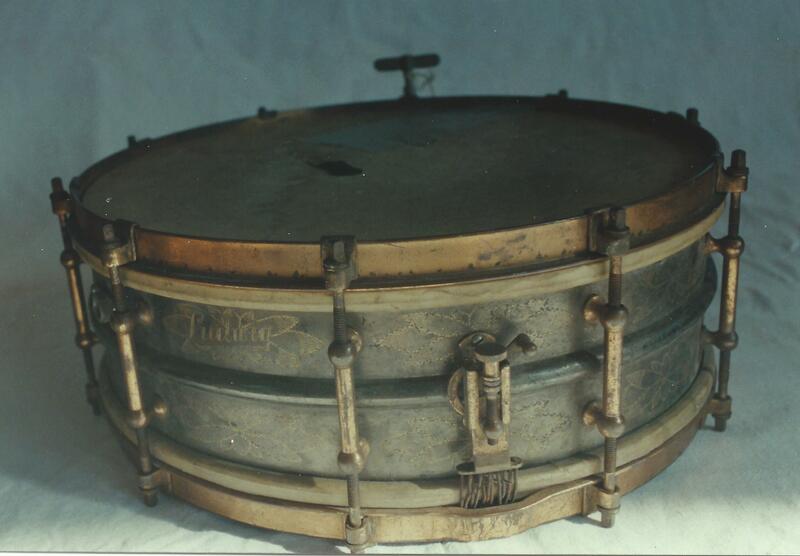 Then research revealed that it was a very special drum made by Ludwig from the 1920’s until the mid-1930’s called the “Black Beauty”. It was made from a single sheet of brass that is machine drawn into a seamless beaded shell, and has a specific and revered tone. We still didn’t know what this might mean in terms of dollar value, but we realized that we needed to reach the widest range of drum aficionados possible so we listed it on E-Bay. Jeanine was listing a lot of French pottery at the time so this was not for her typical buyers, but by putting Ludwig Black Beauty in the listing we were sure to catch anyone doing a search. I think we started it at $100 thinking that if the worst came to worst we’d be fine with that, and then we went about our business and didn’t check until the next morning. Holy moly, it’s up to $600 already! We were pretty happy right there. Then over the next four days we had the great fun of checking in on advancements. Watching it creep up and up until the hammer finally came down at $2,800 U.S. Not enough to retire on, but enough for us to go to France for a family visit and picking trip. What we felt can only be described as ecstatic, tainted only slightly with a nagging suspicion that it was not at all likely to happen again. At least not soon. Lightening striking twice, and all that. Still, I’m a big believer in counting my blessings, and celebrating the little victories. This entry was posted in "Picking" stories, the Old Church Trading days by shadflyguy. Bookmark the permalink. Luck plays a part it is true, but mostly it is your expertise which counted in this case. I would have walked past it without a second glance. . . experience is what counts, and knowledge! Hope you enjoyed that holiday!